One should take the shelter of the lotus feet of Lord Nityananda Prabhu, for He is the original spiritual master. It is by the mercy of Nitai that we can obtain love of Krishna. Lord Nityananda appeared about twenty years before the appearance of Chaitanya Mahaprabhu. Nityananda-trayodasi is an important celebration for Gaudiya Vaishnavas, as without the mercy of Nitai, one cannot get the mercy of Nimai. The eve of Nityananda-trayodasi is celebrated for the purpose of invoking auspiciousness. During the adhivasa ceremony performed on that day, auspicious items are offered to the Deities for Their pleasure. Devotees fast until noon on Nityananda-trayodasi. Their Lordships Sri Sri Pancha-tattva are decorated gorgeously with flowers and tulasi garlands. Nityananda Prabhu’s pastimes from Sri Chaitanya-Bhagavata are narrated during the Bhagavatam class. 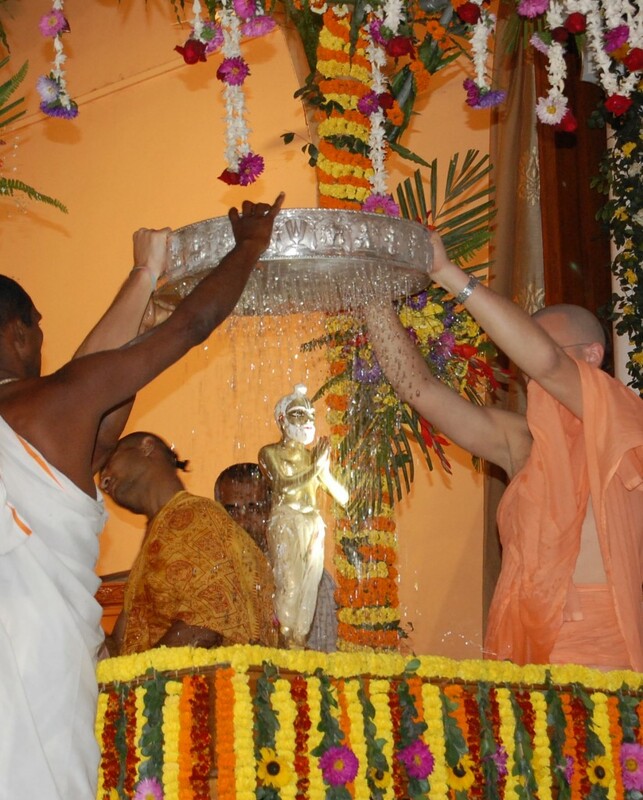 As Nityananda-trayodasi falls very close to the Gaura-purnima celebrations, the participation of the many visitors, devotees and sannyasis adds more color to the festivities. The visiting devotees experience redoubled joy and mercy, as they are able to enjoy both Nityananda-trayodasi and Gaura-purnima. 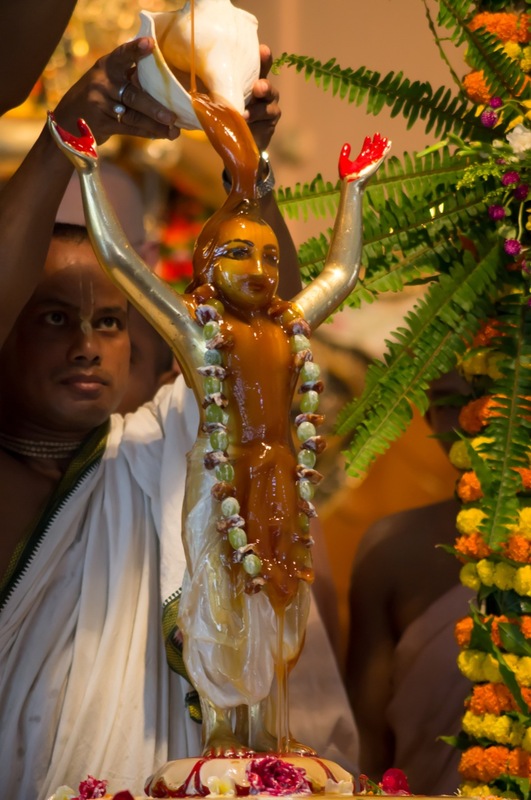 A maha-abhisheka is performed for Sri Sri Gaura-Nitai and elaborate bhoga is offered to Them. 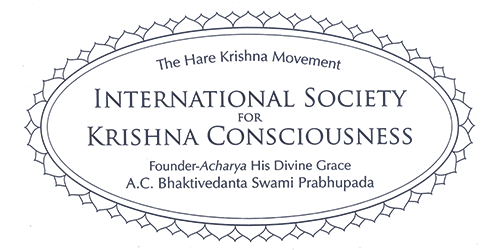 The kirtana plunges everyone into an ocean of transcendental bliss. A feast is then served to mark this glorious occasion. It is through the entreaties and ardent devotion and sincere prayers of Advaita Acharya, the combined form of Lord Mahavishnu and Sadashiva, that persuaded the Lord to appear as Sri Krishna Chaitanya Mahaprabhu. Advaita Acharya had felt grief for the miserable and ignorant condition of the world, and so by offering Tulasi leaves and Ganga water, He cried for the Lord’s appearance. Being pleased by Advaita Acharya, Lord Chaitanya Mahaprabhu appeared. A special mood of receiving the mercy of Pancha-tattva sets in at the temple. The devotees fast until noon on this day. 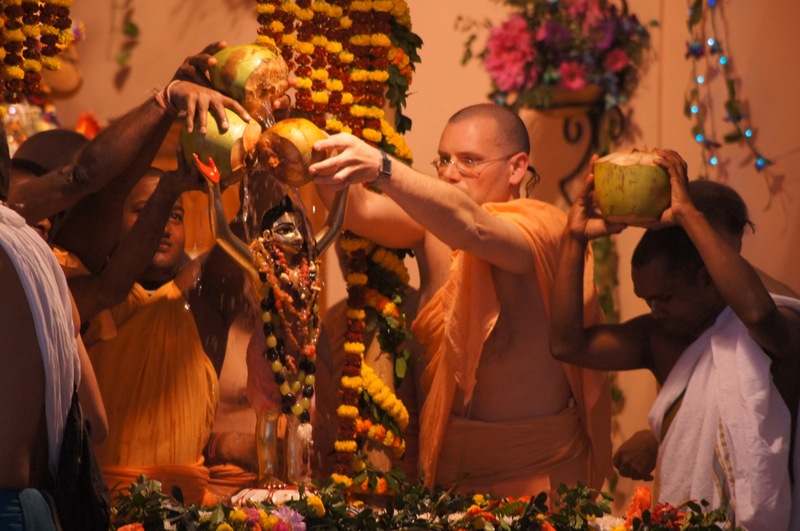 A grand abhisheka of Advaita Acharya is performed with various ingredients, such as fruit juices and colored powders. There is also panchamrita-abhisheka and multi-colored flower abhisheka done at noon, followed by Bhoga offering and Arati. 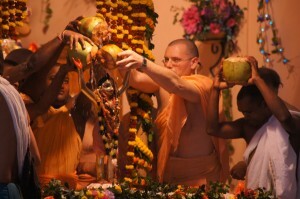 Matajis cook a feast for Advaita Acharya with great love. A tumultuous kirtana accompanies the abhisheka ceremony which surcharges the atmosphere with the ecstacy of hari-nama sankirtana. Srila Gadadhara Pandit`s munificent and sweet nature influenced the whole atmosphere on the day of His appearance in Sri Mayapur dham. The beautiful darshan of the magnificently decorated Gadadhara and other members of the Pancha Tattva bring joy into the hearts of the assembled devotees, causing a jubilant and enthusiastic kirtan to ensue, thus inspiring everyone to dance in bliss. Srivas Angan is the birthplace of Sankirtan movement. 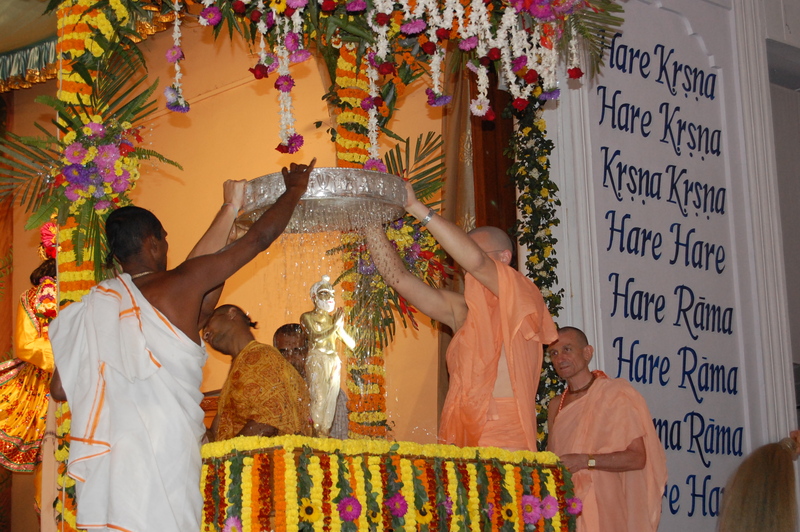 Lord Caitanya inaugurated harinam sankirtan in the house of Srivas Thakur. 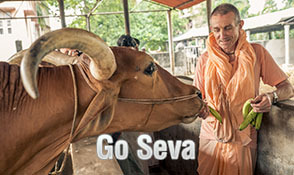 In Pancha-tattva, the bhataakhya (pure devotee) is Srivasa and other great devotees as well. He is previousy Narada Muni who munificently travelled everywhere to spread the message of Godhead. The lotus feet of Lord which is rarely attainable for yogis and sages are very easily attained by the maid servants and devotees in the house of Srivas Pandit. They could achieve such feat simply by rendering service to the pure devotee Srivas Pandit. Such is the greatness of the devotional service of Srivas Thakur. It was in the house of Srivas Thakur, Mahaprabhu exhibited Sat Prahirya Lila or Mahaprakash Lila, where devotees headed by Srivas Thakur performed Maha abhisheka to the Lord. He is a perfect devotee and most compassionate towards the welfare of all living entities.